Wholesale Personalized Computer Duster -Brush. 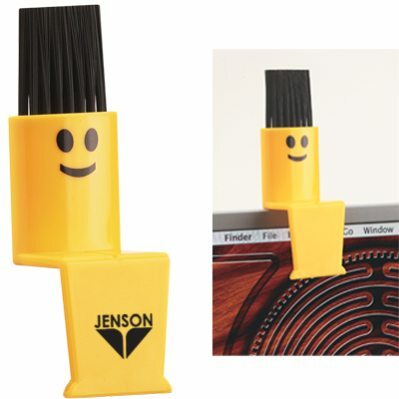 Promotional, Inexpensive, with Smiley face. Budget Prices in USA and Canada. Computer duster -brush, custom printed for business advertising. The computer duster sits handily atop your computer screen. We also supply wholesale blank (not imprinted) computer dusters for $1.10 each. Budget Prices in USA and Canada for wholesale computer dusters -brushes . American clients pay no taxes. We will send you a proof for your approval before production. The unit prices below include your 1-color custom imprint in one location. Additional imprint colors: add $0.25 per color, per unit. Setup Charge: $50.00 per color. Production Time: 10 days after artwork approval; Faster delivery is available at extra cost: please contact us. COLOR(S: Yellow or Translucent Blue with Smiley Face On one Side. IMPRINT AREA Front Bottom: 1" x 3/8"
MULTI-COLOR IMPRINT: add $0.25 per color, per unit. OPTIONAL ANOTHER LOCATION IMPRINT: Add $ 0.20per piece, per position. PACKAGING Cello Bag, 500 per carton @ 21 lbs.